Really, the only reason it was high drama was because Parker Hall is situated at 6,000 feet. Other than that it was just plain drama. 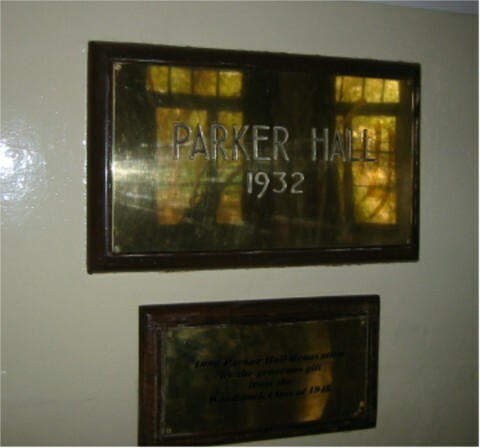 Parker Hall was built in the ‘30s and could seat around 400 or so. It was carved out of the hillside and the windows on that side were just feet from the pushta (stone wall) holding the mountain back. At the front of the auditorium was a stage and off to each side was a raised area, level with the stage. The right side had a pulpit, which was easily removed, if need be. The auditorium had a balcony with one long strip along the right side with one row of seats. At the front of that row, nearest the stage, was one of several spotlights. Outside Parker Hall was a covered porch area for milling around. Outside that was an open area with some seating and a flagpole and where we gathered every Independence Day for a speech and to sing Jana Gana Mana, the National Anthem, and to listen to a speech by Mr. Burgoyne in his excellent but heavily accented Hindi. We had chapel once a week in Parker Hall. Usually these were messages of faith. However, we also had other speakers there as well, often visiting dignitaries–Pearl Buck, for example. Sometimes we would be preached at. That seemed to happen a lot. E. Stanley Jones comes to mind. We had the Dalai Lama a number of times when he was living in our town. He loved our concerts. Good thing he wasn’t there for Peanut’s magnum opus. At one concert we had an opera singer named Lorna Nash. Her husband was a scholar and was doing research, or teaching (or something) at the Forest Research Institute in Dehra Doon. I am not sure if she ever sang as a professional opera singer or not, but she had training to be one. At the concert the electricity kept going out (a not uncommon event). Instead of just warbling away in the dark, she would stop. It was pitch black. Someone would light a candle. By the time that was brought out, put on a stand, the lights would be back on. The candle would be blown out and she would compose herself and start singing again…only to have the electricity go out once more. This happened three or four times, each time with increasing and obvious exasperation on her part. The last time it happened the concert got cut short. She had had it. Which was all right by us because so had we–we had never heard opera before and found that this was an acquired taste. Like beer. The positive thing that happened as a result of all this was that the Nashes donated enough money for a spotlight that would run on a car battery in the event the electricity went out. And, as always happens when money is actually spent like this, the electricity never cut out like it did that night in the next several years I was there. It was here in Parker Hall we had the Hobby Show, usually around the first week of July when everyone brought their collections and displayed them. Some of these collections were stupendous. Ferns pressed, preserved, and labeled. Bird collections. Butterflies. But the ones that I think I liked the most were the beetle collections. Now we all collected beetles at one time or another. During the monsoons a surprising number of these things could be found under almost any light source at night. There were stags, rhinos, cherry rhinos, swears and so on. But the ones that were really interesting were the sawtooths and the five horned rhinos. The sawtooths had a unique set of jaws that could move back and forth and cut through, say, a twig placed between them. They were also about four inches long and had antennae about the same length. The five horned rhinos were rare and were aptly named. They were huge, big enough to fill a young palm, and had five horns growing out of their heads. At the Hobby Show, besides collections of all sorts, there were handicrafts. There were judges and prizes and whether you collected anything or not, this event was worth going to every year. Parker Hall was also the venue for fine musical events like orchestra concerts, one of which I have already described for you in another story. There were piano recitals. Talent shows. If it was a non-sporting event it probably took place here. But what the stage was really designed for with that thick velvety curtain was drama. Acting. Plays. My senior year I signed up for Oral Expression. This elective class was usually composed of around 12 or so, mostly seniors. The reason I signed up was because I was petrified, petrified I tell you, of speaking in front of anyone. I won’t bore you with the details because I can’t figure it out myself and there was no real reason for it. Suffice it to say that even reading out loud made me nervous. This had started two years earlier and was not going away. I figured the only thing was to face the enemy and either get over it or get shot trying. The first day of class, which was team-taught by Mr. and Mrs. Browne, Mr. Browne began with a couple of stories of when he was doing summer stock back in the states. These summer stock stories continued the whole year until we were fairly ill hearing about them. There was going to be no summer stock here. Oral Expression was it. On that first day he introduced us to the “Proscenium Arch”, that part at the middle of the stage where the curtains come together where there was a large, embroidered brown and gold (the school colors) WSC–Woodstock School College, a throwback to British nomenclature. I was there to learn. Etched deeply into my little noggin now is the “proscenium arch“, a word he continued to use that first day at least thirty times. I am still uncertain why this proscenium arch was so important, but believe me the proscenium arch was important to Mr. Browne. Proscenium arch. Proscenium arch. Our class met twice a week and we would sit around and read through short plays. I found that engaging myself to be the character I was reading I could become that character and not Steve Van Rooy, the guy who would choke and balk when asked to read out loud. So far the plan was working. The Brownes would have us do various exercises. Free expression was one. We would pantomime something and everyone would try to guess what it was we were trying to do. One day in September they brought to the class an Indian gentleman they introduced as Shankar Suhail. Mr. Suhail was a leading film actor in India, they explained, and was going to give a demonstration and a short lecture. We all sat up a little straighter. We had never, ever met a film star and film stars in India are treated like gods and end up becoming elected officials. Mr. Suhail was clearly a professional. He gave a little demonstration of his acting skills (impressive), and then a short lecture on acting, and then opened it up for questions. One of the last questions asked was which of his movies he liked the best. He named a number. The last one, Akri Khat (The Last Letter) he casually mentioned was currently playing at a cinema over in Library, on the far side of town. John Taylor (who was not taking oral expression) and I decided we would like to go see Akri Khat. You may recall that my parents did not want us to go to movies in Mussoorie. We could sneak down to Dehra Doon and see them there (which we did). And we would go to movies on vacation in other places like Delhi or Calcutta to see classics like “The Ten Commandments“ and “Ben Hur“, but we did not go to movies in Mussoorie. This Hindi movie was the first movie I ever went to in our town. I felt a bit guilty about this and yet felt somewhat justified because it related to my Oral Expression class. It was a terrific movie. In one of the close-ups of Shankar Suhail I noticed there were some marked differences between this actor and the one we had met in class. This one on the screen had some pockmarks on his cheek. Our Shankar Suhail did not. This was a puzzle, but it could easily be attributable to makeup. That was it, makeup. This was one of the finest lesson in acting I think I ever had. We did a couple of plays. It was kind of a tradition to do one semi-major play before going down day. The play we were doing was called, “The Defeated”. Everyone had a part except for me. I sat this one out. Skillicorn had the lead role, a German army officer I think it was. However, just a week before the play was to be given Skillicorn got expelled for getting caught in his girlfriend’s room down at Midlands after lights out. Chris Willey was a cute little gal and I am sure any one of us boys would have loved to have been in her room after lights out. She did not get expelled, but Skillicorn was gone for the remainder of the semester (about two weeks). This meant that I had to learn his lines in a week. Which I did, shocking the Brownes and surprising even myself. I was kind of liking our little drama class by this point. I had found something I could do halfway well. I found that I was overcoming my fear. I found that acting was a bit of a con-job really and I kind of liked that. The Brownes were excellent teachers. They had a real passion for acting. They had high expectations and were demanding. And in all of that they still managed to make it fun. In the spring we began looking for a major play to put on at the end of the school year. The one we settled on was Arthur Miller’s “The Crucible.” This is a pretty heavy drama about the Salem witch trials in the 1600’s. As it turned out, lo and behold, totally unexpectedly, I was asked to take the role of John Proctor–the lead role. Such an honor as this had never happened to me in my life. I determined to do the best job I possibly could. We practiced all spring. When there was good weather we would go out to the flagpole outside of Parker Hall to do our parts. It was a most pleasant way to learn lines, get coached and soak up a few rays. We gave the play “The Crucible” on June 14th and 15th, Friday and Saturday of 1968. This time of the year was packed with activities. Parents were up to visit their kids. Plans were being made for travel to the US. Graduation was around the corner. Signing parties for the yearbook. Exams were near. And in the middle of all of this we, the members of the Oral Expression class were giving a performance of a play that had never been done here before, a play about supposed witchcraft, false accusations, and adultery–all of this pretty edgy stuff for a missionary community. The dress rehearsal on Thursday went very well. We got decked out in our costumes, got grease paint on, got made up, and voila! We were there. There was scurrying around backstage, lights, curtain, action! We were on. The stage crew were pros. This often-maligned group of guys made it all happen. The play could not possibly have taken place without them. O.K. O.K. We were ready. At this point the Brownes’ role was pretty much over. They had done their job. Now it was time for us to do ours. Then came Friday night. We were backstage and had been getting ready for an hour. Skillicorn’s hearty laugh could be heard above the din. Alter was making faces in the mirror. Ursula Gruber was getting psyched for her role as the bewitching Tituba. Seefeldt peeked out and informed us Parker Hall was filling. Conrad was in his clerical collar making most unclerical asides. The Brownes were calmly making sure everything was in place, costumes in order, final check of makeup. And me? My stomach was churning. There were going to be 400 people out there, parents, students, staff and guests. What the fat was I thinking when I signed up for this class?! My mouth went dry. Water, water! I discovered there actually was such a thing as “a cold sweat.” All I could think about was falling flat on my face, forgetting my lines, or repeating my lines in a wooden manner, looking dumb. Shame, embarrassment, and nervousness gripped me. It is amazing the energizing effect of those very negative emotions. I leaned back. Expelled a big breath and DETERMINED to do my very best come hell or high water (this was one of the very few phrases we learned we could use with the word “hell”). The lights flickered out in the auditorium. A hush fell over the audience. Mr. Browne sang out, “Places everyone!” We were quiet and in place. Those of us who did not have to go on right away had a copy of our lines in hand, going over them one last time. We were on. Off we went. And it went well. Spectacular in fact. There is one scene in which I got to kiss Kathy Hess, my wife Abigail in the play. This short little scene was a dream come true. Where else would you get a chance to kiss a cutie like Kathy and it be OK? I mean here was Mrs. Browne telling me to kiss her with feeling, “Put some passion into it, Steve.” Can you imagine that? A missionary staff member encouraging me to kiss someone passionately? Well, it would have been better, I think, if I had had some previous practice. But the sad fact is that I had no practice whatsoever. And although it might have looked passionate, believe me all we were doing was mushing lips. Something like this could have been an exquisitely delightful reward for my role, a delectable little treat, but all it turned out to be was bad acting. Rats. The final curtain came down (or across, really). There was thunderous applause. We modestly came out and took a bow. More applause. We were forced to come out again. And one more time. We got the distinct impression they liked it. Hallelujah! And the Browne’s were most pleased. The second night went just as well as the first night. We celebrated. We laughed. We laughed at Conrad’s astonishing ability to ad lib so freely and so well on stage. We were elated. We were complimented all through the next week. But then other activities surrounding graduation–exams, parties, travel plans for leaving India–pushed the play into the past. At graduation various awards were handed out, honors given, talents recognized. It came as a total surprise when my name was called for the Jimmy Casinath Drama Award. I was humbled and yet strangely proud. I went up to receive my award. On the way down from the platform I noticed the Brownes, pleased and proud…for me. When the ceremony ended the Brownes slipped out the side door. I followed and found them outside. Award in hand, I fumbled with words of gratitude, my eyes misting (…or was it just the monsoon humidity? ).